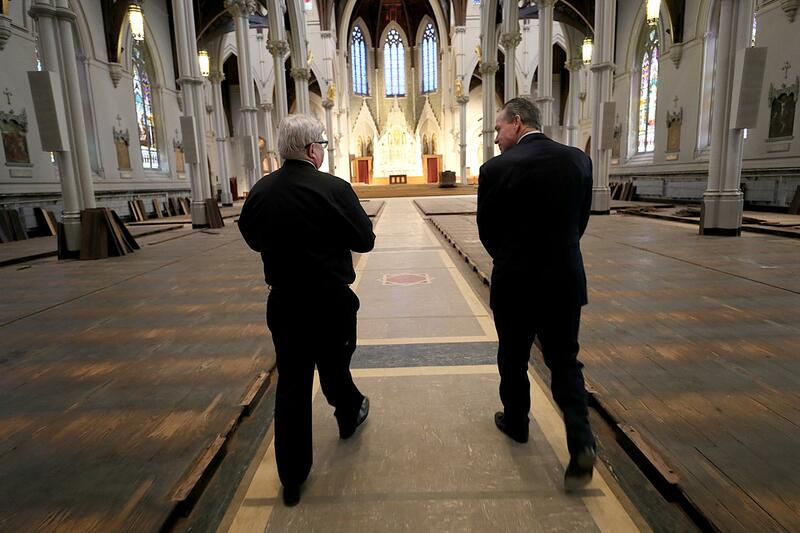 Father Kevin O'Leary (left) and John Fish of Suffolk Construction walked through the Cathedral of the Holy Cross in Boston. The roof leaks. The wiring is shot. The heating system is temperamental. And — I’m not afraid to tell you — there are bodies in the basement. And yet when the priest and the builder, the latest caretakers of the 142-year-old puddingstone church on Washington Street, close their eyes, decades of decay and dust suddenly disappear. They see a sparkling jewel. They hear an angelic choir and the tolling of 19th-century bells. They can smell incense — ancient and holy — wafting over a congregation who calls this place their spiritual home. Simply put, they envision a shining, newly remodeled home for the mother church of Boston Catholicism, a home that had grown careworn, even neglected, and needs just about everything — new roofing, new altar, new systems, new floor, plus polish and paint from entrance to apse. Boston Catholics have knelt in prayer at the Cathedral through world wars, economic calamities, pennant races, political upheavals, and presidential assassinations. John Fish is the chairman and chief executive of Suffolk Construction, and his firm is leading the $25 million refurbishment of New England’s largest Roman Catholic Church, whose construction was interrupted by the Civil War and whose main altar has been quiet since June, when all Masses were moved to the cathedral’s smaller chapels. Boston Catholics have knelt in prayer here through world wars, economic calamities, pennant races, political upheavals, and presidential assassinations. Babies were blessed. Couples were wed. Bodies of the faithful were sprinkled with holy water amid solemn prayers for perpetual light and eternal rest. In November 1964, Cardinal Richard Cushing celebrated Mass here, praying for the soul of a native son, John F. Kennedy, murdered in Dallas a year before. “A senseless blight on our country,’’ the cardinal said. President Obama was here in April 2013, speaking at an emotional interfaith service for the Marathon bombing victims. “You will run again,’’ the president told the wounded. Across the years, the old granite-trimmed church has been fraying at its edges, and then some. Fifteen years ago, as the global church was rocked by the clergy abuse scandal, whose epicenter was here in Boston, it didn’t seem the time to launch the costly repair work needed. Now, O’Leary said, it feels a right and proper — and joyful — thing to do. O’Leary’s relationship with the cathedral dates to his days as a seminarian, when Cardinal Humberto Medeiros would hand out brooms and mops to his young charges to clean up bird droppings in the sanctuary. But he did. O’Leary now works out of an office in the basement, where he and Fish are plotting the resurrection of the cathedral, with the work to be completed sometime around Easter 2019. 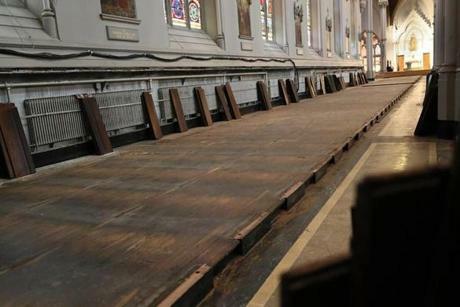 The pews have been removed; they will be refinished and re-installed. All the pews have been removed. They will be refinished and re-installed. Water-damaged walls and leaking roofs will be repaired. Ceiling beams will be varnished. Columns will be painted. Newly restored stained glass will be illuminated from within at night. There will be a new oak floor in the nave. A new altar. A new sprinkler system, digital sound system, and LED lighting. And, praise the Lord, newly installed air conditioning will provide relief from summer’s swelter. The cathedral rector nodded in agreement. This great building is more than a church. It’s also a social justice center. Homeless families are guided to shelters and permanent homes. Hungry people come for food and clothing. A food pantry feeds 250 families each week. There are free immunizations. The church’s basement serves as a backup shelter for the Pine Street Inn. There’s a kids camp here in the summer. There are weekly meetings of Alcoholics Anonymous. Some $6.5 million has been raised so far for the renovations — about a quarter of what will be needed. Fish, who is making a seven-figure donation to the project, said his company will perform the reconstruction work without profit. 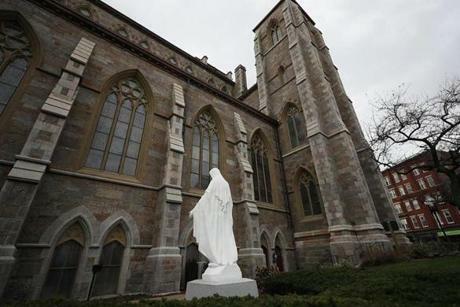 Fish, a former altar boy at Resurrection Church in Hingham who once chaired the board of trustees at Boston College, believes the renovation effort marks a homecoming of sorts — a return of energy and enthusiasm to a church in need of both. “People are beginning to put their faith back in the Catholic Church,’’ he told me as we sat in O’Leary’s cathedral office. “They’re beginning to open their mind, body, and spirit — and their wallets. Now, back for a moment to those bodies in the basement. They are the earthly remains of former spiritual leaders of the Catholic Church in Boston. Behind a wall of marble lies John Bernard Fitzpatrick, who served as bishop from 1846 until his death 20 years later. Nearby, there is John Joseph Williams, Boston’s first archbishop, who preached from the pulpit upstairs until he died in 1907. This is where Cardinal Sean O’Malley hopes to be interred some day in the distant future in a crypt soon to be cleaned and restored. If he is entombed here, he will need no further epitaph than the one expressed in splendor above him, a cathedral of kaleidoscopic light, and gleaming marble — the faithful center of an old church once stained by scandal and soot and now being slowly reborn. 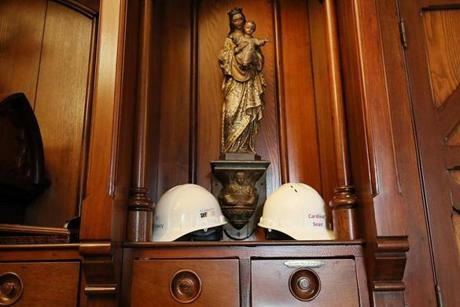 Construction hats for Father Kevin O'Leary and Cardinal Sean O'Malley were visible at the Cathedral.